My essay books about life in Kansas make great gifts! People buy them and send them to relatives and friends who have moved away from Kansas and dearly miss our long views and open skies. And – people who still live here love these books, too. I know you can think of two or three people right now who would enjoy my latest book: Waiting on the Sky. 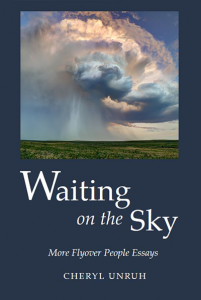 So, for you early Christmas shoppers, today and tomorrow I am offering a special: Buy two copies of Waiting on the Sky and get the third copy for FREE! And there you have it, for $40, which includes shipping and handling, you’ll have 3 Christmas gifts taken care of. How easy is that? This fantastic offer is only good today and tomorrow, Sunday, Nov. 16, and Monday, Nov. 17, so get your order in now. PLEASE NOTE: ORDER TWO COPIES (on Nov. 16 and 17) AND I WILL AUTOMATICALLY INCLUDE THE THIRD COPY FOR FREE IN YOUR ORDER! YOUR COST WILL BE $40, SAVING YOU $20!! What a deal! Order today! Offer expires 11/17/14 at midnight, Central Standard time.